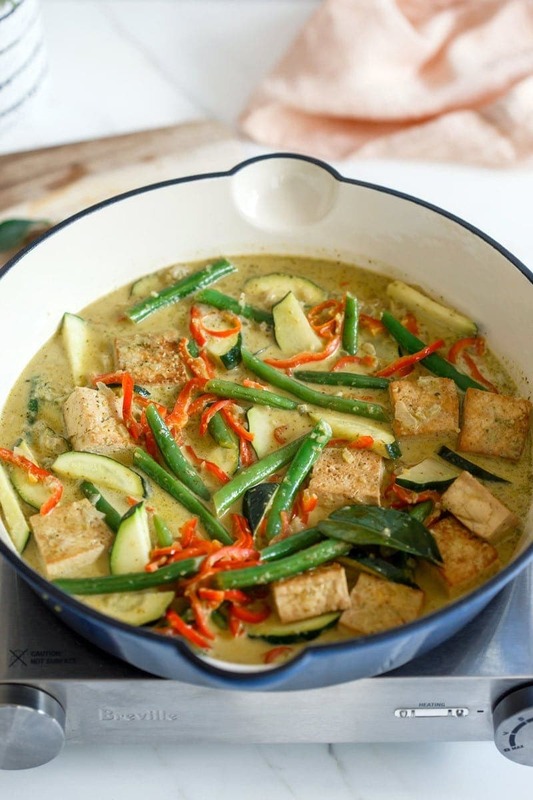 A fragrant vegan Thai Green Curry made with homemade curry paste. Use whatever fresh and crispy vegetables you have on hand at home – I like to go for something green, something red, something soft, and something crunchy. Finish with some Thai basil and you’re onto a winner! I made this meal out of necessity really – we have the most divine Thai restaurant local to us, but their green curry often has a hint of that distinctly fishy shrimp paste – even though they claim it to be made without… curious. Well, call me paranoid, but the beauty of homemade means that you can be 100% certain of just what has gone into it – no dried, fermented, salty prawns for me thank you! 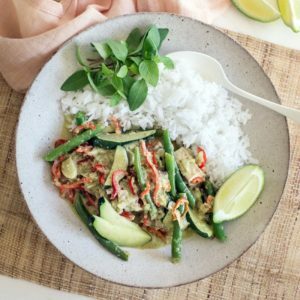 Now, this recipe calls for a pre-made Thai Green Curry Paste – which I shared a few weeks back here. 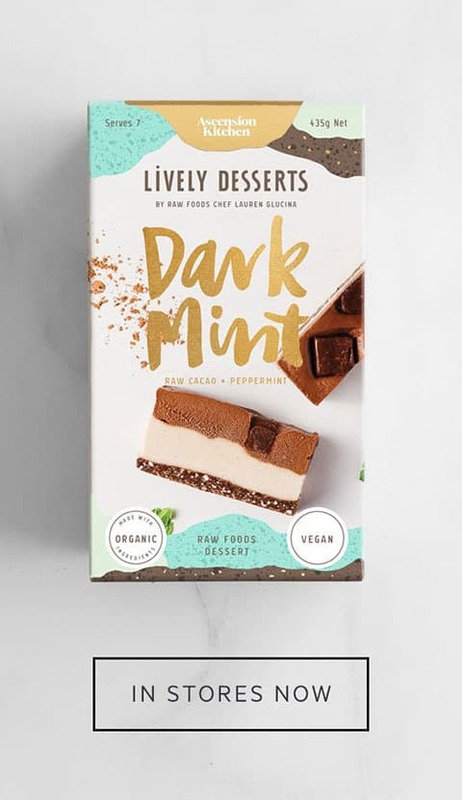 Feel free to use store-bought if you can find one with an ingredient list you’re happy with. See how I froze the paste into cubes ready to go? This means as long as you have some tofu, vegetables and coconut milk on hand, you can thaw and add the paste and you’ve got a quick and delicious meal. 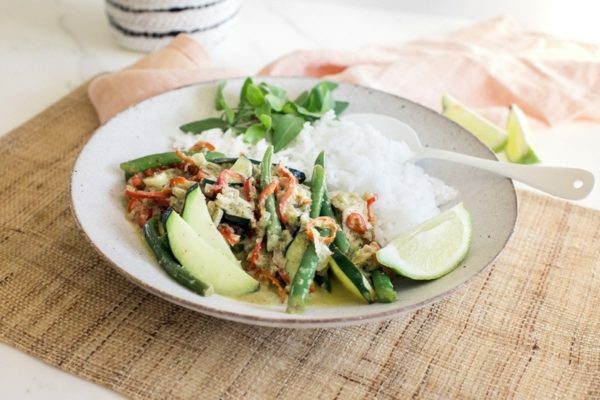 What I love about his dish is that it is just so fragrant – lemongrass, ginger, coriander, kaffir, chilli, cumin… all coming from the rich paste, with sweet coconut milk, salty broth, and a mixture of fresh vegetables. If you pre-make the paste, you can have this prepped and whipped up within 30 minutes. I have a bottomless pit to feed here, so I served it with rice, but a lighter grain like quinoa would be just as nice. You know what I’ve discovered – marinating your tofu (or even giving it a good coating) in a seasoning like tamari (gluten free soy sauce) before frying it makes it so much tastier. So for this recipe, you’ll do just that – cube it, coat it, fry it in olive oil, then push it to the side of your pan/wok/skillet, and add in your shallot, garlic and chilli. Once golden – add a few tablespoons of curry paste and stir it all together – once it starts to sizzle you’ll notice that rich fragrance from all those lovely aromatics in there. Add full fat coconut milk (otherwise, you may end up with a rather watery curry) and vegetable stock, and reduce it down for a few minutes. Add all your fresh vegetables and cook for just a quick few minutes – until they are just soft enough – then plate up and enjoy. 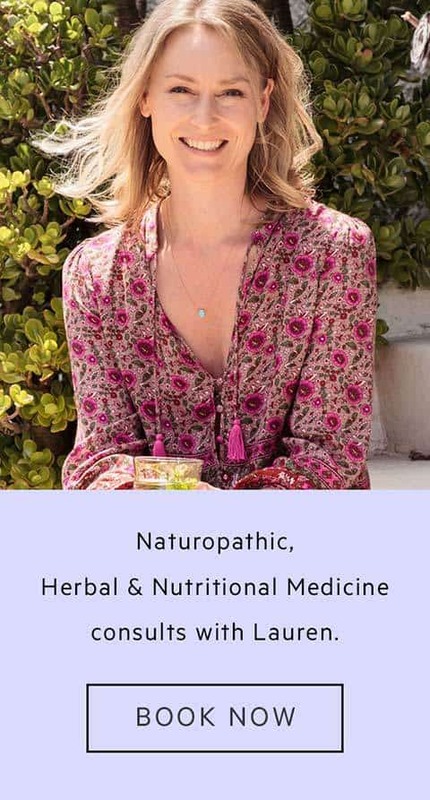 This got a very muffled double thumbs up from my man – so I think it’s a goodie! Hope you enjoy it, and see you next week! Prep: finely mince the shallot, peel and mince the garlic, de-seed and slice the chilli. Wash the beans, trim off the tips, and cut into halves on a diagonal. Slice off the ends of the zucchini, slice vertically down the centre, then cut into slices on the diagonal. Cut the Spanish pepper in half lengthways, remove the seeds and slice thin. Rinse rice well then cook as per packet instructions and set aside. 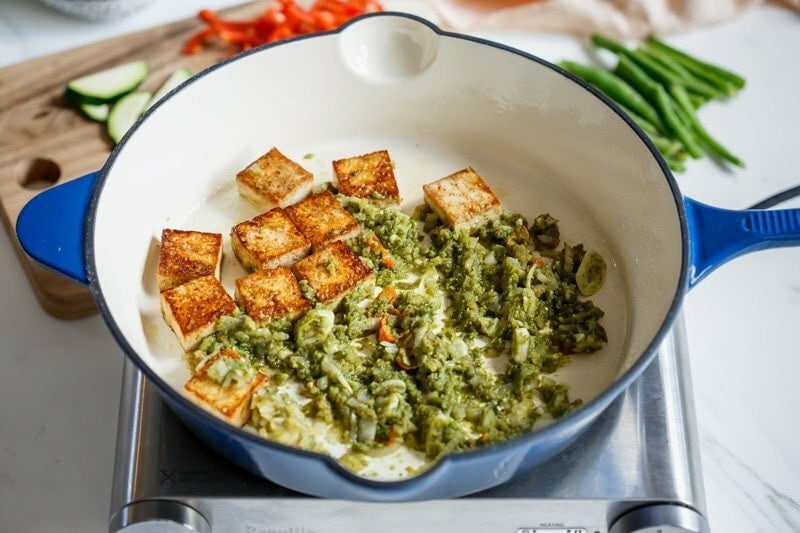 Curry: Ideally, marinate the cubed tofu in the tamari sauce for an hour before you start to cook, otherwise, coat it well, then add to a hot wok or skillet with 2 tablespoons olive oil, and cook till just browned on all sides (just a few minutes). Push the tofu to the side and add minced shallot and cook till golden, add garlic and chilli and cook another minute. 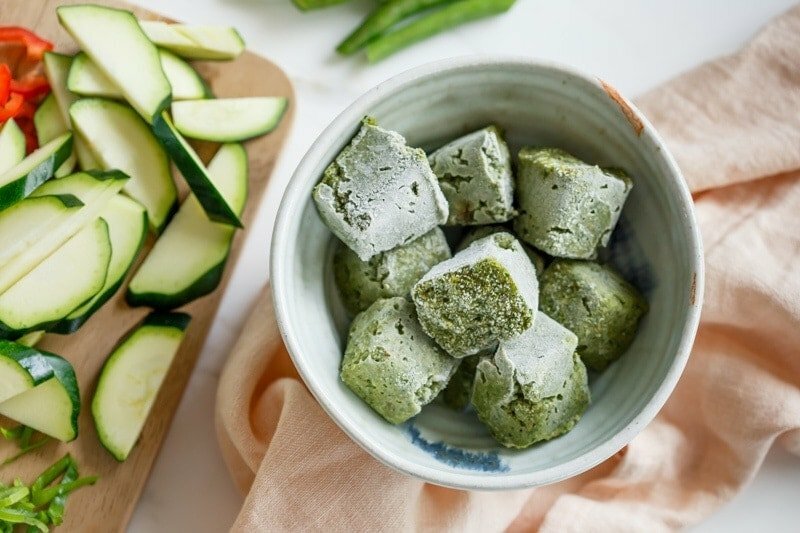 Add the Thai green curry paste (thaw first if using pre-made frozen cubes) and cook till fragrant, combining all ingredients in the wok/skillet now to coat. Add coconut milk and vegetable stock and let the mixture reduce down over a few minutes. Add all vegetables, lime juice and coconut sugar (little at a time – you may find it sweet enough), and cook a final few minutes till the vegetables are just soft. Serve with Jasmine rice and fresh Thai basil to garnish. 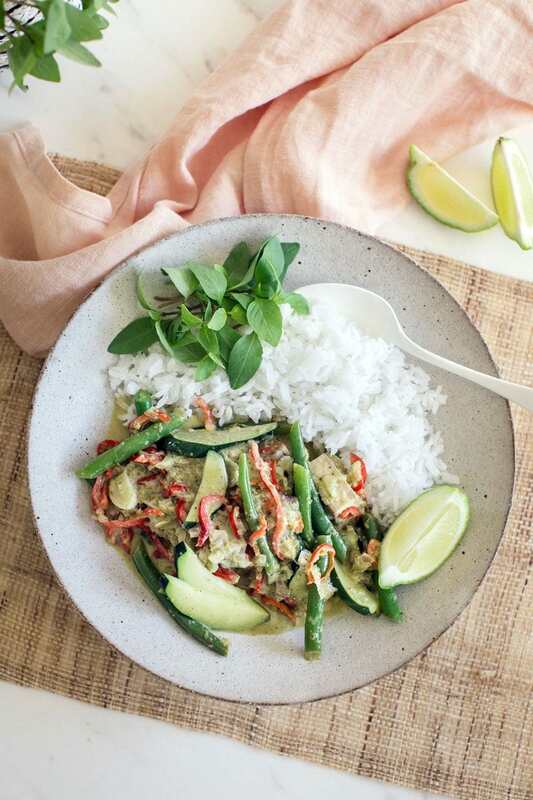 This recipe requires Thai green curry paste. It’s near on impossible to find a vegan curry paste – without the shrimp or fish sauce, so you may like to try my recipe in advance of cooking. I suggest making a double batch of the paste and freezing into cubes (approx. 1 rounded tablespoon per cavity) ready for future curries in a hurry! Leave the seeds in your chilli if you’re wanting more heat. Crunchy baby corn would have been amazing but I couldn’t find any – any mixture of vegetables will work, but I like to go for something green, something red, something soft, something crunchy. If you like your curry more ‘soupy’ – use an extra ½ cup of vegetable stock. Nutrition panel is an estimate only, and includes a large serving of rice.